By fraves, December 27, 2011 in INTRODUCE YOURSELF! I am new to any boards and I need any help info from you. We found out my dad has stage 4 lung cancer. It has spread to his spine,neck and his bicep. He has had two treatments of chemo. He had pain in his neck. That is gone but he has major pain in his left bicep. It is so bad he can not move his arm. I am worried the chemo is not working. He went to NIH tday and they are going to move forward and do a biopsy. We hope he will be a canidate with the info that comes back. They also recomend him to go back to his dr to do another mri b/c of the pain in his bicep. I am worried that his cancer has spread and that this is further along than once thought. He is bummed the chemo is not working and they have him on so much pain medicine all he does is sleep. I am so worried and wanted to see if I can get any info from you. PLEASE HELP. 2 treatments might be too soon to know if its working. sometimes the body takes a little longer to get used to that stuff. How long ago where the treatments? not familiar with bicep pain from Lung cancer but am familiar with shoulder pain almost like arthritis! Would the recommendation of a cortizone shot help for the Bicep maybe? Just a thought for you! that is used for arthritis patients routinely for pain relief BTW! What are the names of the treatments!? When was last one done? Which Bicep is hurting him ? do they know what type of Lung Cancer yet? They should if they are doing treatments! Let us know so we can help you some more! Saying prayers for some relief and answers for you and dad!! I agree with Randy that two infusions is too soon to assess if a chemo is working. It sounds to me that his quality of life is what is bumming him also and that might come significantly from the bicep pain and the pain meds making him sleep all the time. That fatigue is compounded by the chemo. There is at least one member onsite who is a survivor from NIH with a wonderful story/outcome. Maybe Kasey will pop in soon. I hope his drs will heed NIH recommendation to look at that bicep again. Also, sounds like some different pain management could be tried. Do keep in touch and give us more info along the lines Randy suggested. I concur with Randy and Judy. If you could give us more information, we'll try to help. Two infusions is not enough to make a difference yet. They usually do four or five rounds of chemo before seeing a difference. Wishing the best outcome for you and your Dad. I'm not a doctor, but scanning after two (or three) rounds of chemo is quite common to see if it is effective. If it is not doing any good, they will usually try a different cocktail at that point. You describe your Dad's diagnosis as Stage IV lung cancer - dear one, there is no Stage V. Once it has spread beyond one side of the lung, it is out there and you can hope that the cancer responds well to treatment and that they manage any pain well, but the time has passed to be terribly worried about how far it has spread. I am sorry. That does not mean that there are not treatment options - there are! Hopefully, the NIH biopsy will show that he has an EGFR mutation, so that oral Tarceva is a likely candidate for therapy, or that he has an ALK translocation so that Xalkori is a different oral option. Both of these have excellent treatment value in the right patients. Tarceva is an option for 2nd line even if he does not have the mutation, though one would not expect as great a response to it. Take care of yourself - it takes a lot of strength to be a good caregiver and he needs you now. Hi fraves, My cancer was stage 4 with 1 met in the spine. I can tell you that what happened to me was nerve damage caused by the invasion in the spine. I felt pain in places way far from the tumor. My tumor was on the right side at the apex. The ulnar nerve was there and it made alot of pain in my shoulder, tricep, elbow, and hand. When i was being misdiagnosed at first, the PCP tried a bunch of different stuff. He even sent me to an orthopedic dr. That dr. did give me cortisone in the shoulder. It felt great for about 3 hours. It kinda made me think i had rotater cuff damage. I'm all full of arthritis too so it's hard to tell. I get confused alot with my situation. So, anyhow, that was almost 3 years ago and I'm in remission and feeling pretty good and lucky too. There are some great survivors here with alot more mets than I had. I hope Janet shows up here with some insight for you. She had I think 4 spine mets??. I don't know if his bicep actually has a tumor in it or not. You didn't say. It may be just nerves going crazy like mine did. I will say that after a few weeks or so of combined radiation and chemo, the pain began to subside as the tumor shrunk. Pain management folks helped alot too with their pills and even a fentinol patch. Point is, there is so much reason for hope and encouragement. It's easy for a dr. to say a timeline based on statistics. We are all just as different as we can be and our cases are too. I hope you read back some stories of survival on this site. I hope you keep us up to date too. A positive attitude and the will to fight are the first weapons he'll need. He has you too. Hi Fraves - I am so glad that you found this site - you will find, as you probably already noticed, that everyone here is very supportive! It seems that the pain your father is in is the biggest issue right now. When I was first diagnosed, I had 3 mets in my spine and one in the pons area of my brain. These mets were affecting the nerves which caused terrible pain in my femur. The pain got so bad that I couldn't lift my leg, get up from a sitting position or sleep. I was put on steroids right away and started on radiation. Between those two - the pain went away and has not returned. Has your father been given steroids and/or radiation? If not, that might be a question for his doctors. We are all interested to hear what happens with the biopsy. Treatment can be very individualized depending on what they find out. Gone are the days of treating everyone the same way. If you would like, take a look at my story (in the My Story forum) Hopefully it will give you some encouragement. And, please keep us posted on what is happening and with any questions you may have. WOW. Thanks so much for all the information. I am going to pass along thie info. I have some more info. Its hard to get it out of my dad b/c he is trying to hide it from my brother and I so I went to his girlfriend and she is helping a bunch. I dont know what half of this stuff is but I am working on my own research. Here is wha my dad's girlfriend sent me when I ask what he has. Favor adenocarcinocma, includes squamous and adenosquamous cacrcinoma. Again he has it in his spine, lung, neck, shoulder, nodes, and arm. Stage 4. He goes to NIH next week to do the biopsy and will have results in 2 weeks to find out if he has a gene that will help fight the cancer (DOES ANYONE KNOW ABOUT THIS TREATMENT IS THIS THE MUTATION YOU WERE TALKING ABOUT). I guess this is the latest treatment. Even though it wont cure him it can add on 1-5 years per the dr. They are doing another MRI on his arm to find out what is going on with the pain. Also they are stopping the chemo only untill the biopsy is done then he will get back on it. ok a little good news here is that he actually has the most common type of Lung cancer! that means more researched and treatment options available! Now we also Use a site called Cancergrace.org for our medical research. Dr jack West is our on call Oncologist specializing in Lung cancer and he is at the Swedish Institute in Seattle Washington! the Site is free to use and many of our fighters are also over there as well posting so you will recognize a lot of names! "Hopefully, the NIH biopsy will show that he has an EGFR mutation, so that oral Tarceva is a likely candidate for therapy, or that he has an ALK translocation so that Xalkori is a different oral option. Both of these have excellent treatment value in the right patients. Tarceva is an option for 2nd line even if he does not have the mutation, though one would not expect as great a response to it." Those are the two miracle targeted therapies the FDA has approved for advanced lung cancer. So I have been told that around 50% have this gene to be able to work for this mutation treatment. And if the treatment works it could add up to 1-5 years on a person's life. Does that mean my dad has a 50% chance of getting 1-5 years rather the 6 months the dr once said? Thanks so much for sharing info with me. I have learned so much from all of you. See, thats the first rule around here!!! never listen when the doctor says you have this many months!! only god knows how long we have not the doctor! Almost everyone on this forum ahs lived past their doctors diagnosis of how long. we recently lost a 15 year fighter here. So do not listen to that part. The key is IF everything lines up. No guarantees or promises. lots of hope and prayers though.. LOTS of that !! Right now due largely due to lack of funding and survivors eligible for clinical trials, Lung cancer is behind everyone else in research. Oncologists and scientists are racing to get Lung Cancer to a maintainable state then a curative state. They want to treat it like diabetes and other health issues like that. THEN they want to work on the cure for it! so right now we fight for every single day to keep living to get to that point of where they go here is your daily pill to live with and then they start working on a cure for it! Unfortunately, the % of people with the EGFR mutation is much smaller. Much. Last I read, 52% in never-smokers, 15% in past-smokers, and 6% in current smokers. But if he has the EGFR mutation, the likelihood of a good response is in the 65 - 75% range. The % for ALK is even smaller - maybe 4%. But the response to Xalkori for this group is impressive. I got 15 months on Tarceva and am a year beyond stopping that drug. 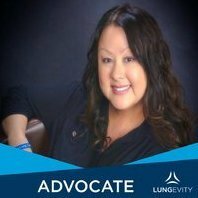 Stage IV lung cancer can be treatable as a chronic illness. There are at least 3 recognized chemo treatments, and a handful of oldies but goodies that can be tried as well as clinical trials. His performance status and how the cancer responds to treatment are far more important than any statistics or timelines anyone can quote. Maintaining weight (eat!) and activity are key. Some will say a positive attitude, but cranky people survive cancer too. The most positive attitude won't necessarily keep you alive, but it make the days go by in a more pleasant way for everyone. Thanks to both of you. I am staying positve for my dad. I am not one of emotion but the last weeks have been full of them. My dad was a smoker and I think even after all this sneaks a cig. It makes me so mad but I dont wont to upset him at all. He is in a lot of pain in his left bicep and can not move his arm and he has lost a lot of energy. We are hoping once the mri is complete that it will give them more info to get rid of the pain and he can do more. I hope for the best. Pain is priority number one in Cancer treatment! smoking cessation is number 2 BUT you can not tell dad what to do of course! You might mention that most treatments are more effective if He is not smoking though.. but all you can do is mention and let him make decision! they should be addressing energy levels with steroids possibly with treatments! So my dad went and saw his onc today and I am so confused. When my dad went to NIH the drs there said the chemo is not working and to stop. Also they said to do a MRI because of the intese pain in his left arm. They said that should not be happening. So he went to the onc and he said he does not agree w the NIH drs and that its too early to see if the chemo is working. Any suggestions. He had 1 cycle and starts the nexty cycle on Thurs. Also my dad is having the severe pain in his arm and no pain medicine is working. He had a MRI but could not do the full test b/c of the pain. I have searched and searched on the internet about arm pain. Alot of people have it but there is no clear answer. I have found b/c of the lung, the cancer in the spine, bc of the chemo, bone met, etc. How can there not be a clear answer to this. I just want the pain to go away. I hope they are not discontinuing all treatments though.. just because one does not work doesn't mean none will! I am not sure about the Arm pain though? Have you tried over at CancerGrace.org to ask Dr West about that one??? They are keeping him on chemo. Has another treatment tom. I went on cancergrace and asked this q. Thanks again. Thanks Katie for the thoughts. My dad is doing good. He did a pet scan last Friday and they found that the mass is smaller. They did find that the T10 spine has increased. He is set up to do a 10 day spot radiation. His arm is feeling a little better. Good enough for him to drive again. I hope the radiation helps with the pain. If I could do it over again I would ask my dad to get a 2nd look at the pain. His Dr swore it was ortho related and it turns out it was not. If anyone is going through this please push your dr to look harder. My dad was told he had a pulled mucsel but it turns out the cancer spread to the bone in his shoulder. Now I have the harder part to get him to stop fing smoking. It is driving my brother and I nuts. He quit smoking and all this is made him smoke again. I cant beiieve it. He tells us he is stressed and once things calm down he will stop. So frustrating. studies show that the chemo works better if you do not smoke! I know it is tough to quit doing but it literally could save his life and make all these treatments worthwhile but tell him do not put it off!! Quit now and his chances get better! not that they are not but... Hoping and praying for great news!! This all sounds hopeful, and am glad they found the reason for the pain in the arm. i was going to suggest that it was the cancer spreading because a friend of mine has the same cancer as your Dad. His spread to his arm too. He had radiation therapy to the spot and it did help. As for smoking? That's a tough one. My brother-in-law was a heavy smoker, and he never quit, even after getting the stage iV news. He smoked until he died. He battled the disease for a year. Quitting smoking is so difficult. Many people believe that it relieves stress, which is probably why he started up again. Reality is that it increases blood pressure, and anxiety. But no one can tell him to quit. Arguing with him won't help (not saying you are). It's a personal decision and one he has to make. You can love him no matter what, and that is a good thing. Well things are not going as good as planned. My dad did do some spot radiation on his spine and the are where his left arm/bicep is killing him. That helped a little but he now is in alot of pain in his are and both nodes by his neck on are hurting again. The dr put him on a differnet chemo. I asked him to get a 2nd opininon but he told me no. I am going with him to ask some q's myslef to the dr tomorrow. I really want to find out why they have not been able to control the pain. He is in so much pain they have him pretty pilled up and all he does is sleep. When I call him he is out of it b/c of the pills. Can anyone help in some q's I should ask. I really would appreciate it. find out what he is taking ? PAIN MANAGEMENT IS PRIORITY NUMBER ONE!!!!!!!! IS a pain management clinic or a therapy a possibility ?